Governor Kay Ivey said that Blue Origin is a welcome addition to Alabama’s roster of world-class aerospace firms, and its new rocket engine facility in Huntsville will expand the state’s already robust capabilities in space flight. 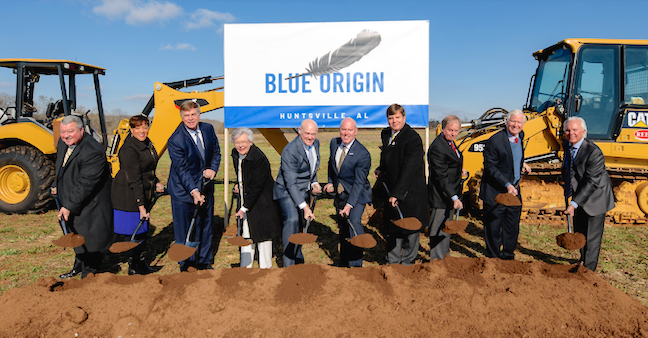 Blue Origin is making a significant investment in Huntsville, and she is certain the company will discover the many benefits of doing business in Sweet Home Alabama’s aerospace cluster. Huntsville Mayor Tommy Battle added that their workforce and their community are ready to deliver for Blue Origin, an innovative commercial space company that is changing what they think is possible in space. These BE-4 engines will power launch systems to put everything from satellites and products into orbit to space tourists and perhaps even space settlers into the final frontier. You truly can’t get to space and explore all of its untold promise without going through Huntsville first. Madison County Commission Chairman Dale W. Strong concluded that today’s groundbreaking by Blue Origin celebrates a valued and continued partnership in Madison County and the Rocket City. Blue Origin recognizes both the strength of local aerospace engineering expertise, and also values the remarkable skill of their advanced manufacturing and workforce capabilities. They’re looking forward to Blue Origin writing a new chapter in their history of propulsion capability in north Alabama. Blue Origin’s engine production facility is the latest addition to Huntsville’s Cummings Research Park, which is the second largest research park in the United States and fourth largest in the world. Erin Koshut, The Park’s Executive Director stated that they are thrilled to officially welcome Blue Origin to Cummings Research Park. As they like to say, the research and development happening here is driven by science and powered by people. CRP has come a long way since it was established in 1962. It is now 91 percent occupied and growing more by the day. We can’t wait to see construction take shape on the new Blue Origin facility and assist the company in recruiting talented people to join their Huntsville team.Governor Kay Ivey visits with the DreamUp team from Bob Jones High School.